Amjad Awad, 19, said to be the 'mastermind' of the Itamar massacre has plead guilty to five counts of murder before a military court. Amjad Awad on Tuesday pleaded guilty to the horrific slaying of five members of the Fogel family in Itamar on March 11. Amjad, 19, who perpetrated the mass murder with his cousin, Hakim, is said by IDF prosecutors to have been the mastermind behind the attack. 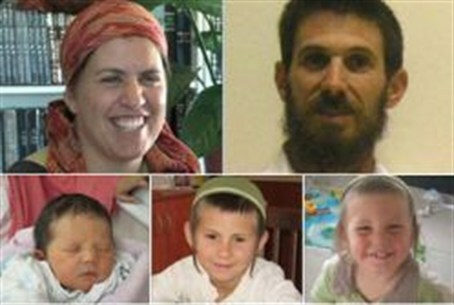 Together the cousins broke into the Fogel home and brutally murdered Ehud (36), his wife Ruth (35), Yoav (11), Elad (4), and 2-month-old Hadas. According to court documents Hakim aided Amjad him by holding down the children for slaughter, and shooting Ruth after Amjad stabbed her. Judges from the Samaria Military Court reportedly examined the primary evidence in the case before agreeing to convict Amjad on the basis of his own admission. Last month, the same court sentenced Hakim, now 18, to five consecutive life sentences plus five years in prison, a total of 130 years behind bars. Hakim was 17-years old when the slayings took place. Amjad's sentence for his role in the Itamar massacre is still outstanding. Both cousins have expressed pride for their bloody crimes.